This Rabbit Stew is surprisingly delicious. I say surprising because I’ve never eaten rabbit before, and because it can be difficult to cook properly. From what I have read, rabbit can easily become chewy or mushy with improper cooking, but this recipe brings it to the right texture and taste. The rabbit is stewed with wine, brandy, vegetables, jamon and herbs. The recipe suggests serving it with potatoes, but since we were in Paris, we served it with a baguette. 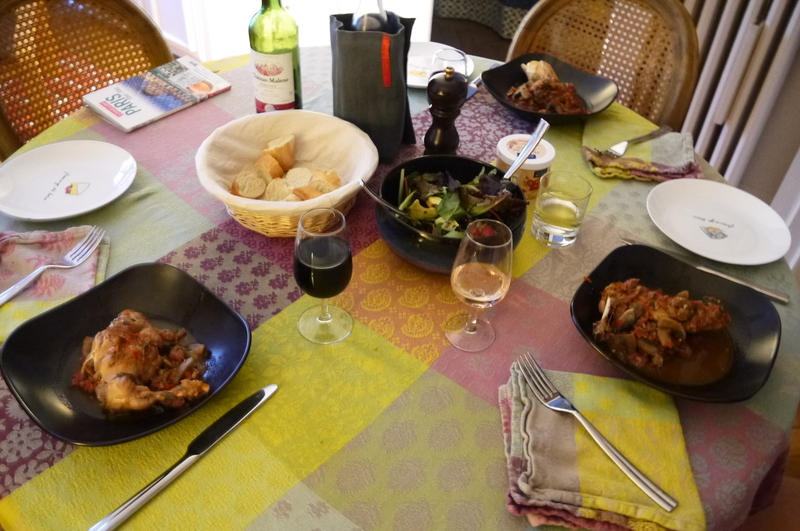 This meal was made while staying with my friends Julie and Jeremy in Paris last summer. I was very excited to have a kitchen in which to make a few meals using local ingredients, and a friend who was interested in cooking with me. Rabbit isn’t something I see in markets at home very often, so Jeremy and I decided to make a rabbit stew. The recipe is from The Complete Mediterranean Cookbook by Tess Mallos. It feeds 6 people. Rinse the rabbit and dry it well with paper towels. Heat a tablespoon of olive oil in a Dutch oven and brown the rabbit on all sides. Remove the rabbit pieces to a plate. Add the remaining 2 tablespoons of oil to the pan and cook the onion in it on low heat until it is transparent, for about 10 minutes. Add the garlic and jamon or prosciutto and cook for 2-3 minutes. Return the rabbit to the dish. Pour the brandy over the rabbit. Ignite the brandy and shake the pan until the flames dies down. Add the mushrooms and cook for 5 minutes, stirring occasionally. Tie the herbs into a bunch, then add them along with the tomatoes, wine, salt and pepper to taste. Cover and simmer with a lid on for 1 to 1 & 1/2 hours. Test the rabbit after about and hour to to see if it is tender enough; keep cooking until it begins to fall off the bone. Remove the lid from the pot in the last moments so that the sauce can reduce. It should become quite thick. Taste to see if you need to add more salt and pepper. Remove the rabbit to a serving dish and garnish with parsley.